The European Court of Human Rights has recognized as illegal the arrest of former Ukrainian PM Yulia Tymoshenko, but refused to look into her claims of torture. The ruling on Tymoshenko’s complaint was announced on April 30, dealing with the ex-official’s arrest in August 2011, when she was put in custody awaiting trial for major abuse of power. 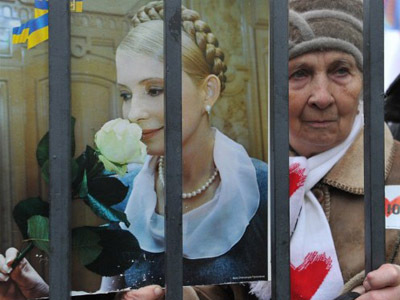 A judge at the time ruled Tymoshenko should be imprisoned for repeated violation of a court order and open disrespect for justice. The defense team filed a complaint to the European Court for Human Rights immediately afterwards. The freshly-announced decision reads that the court found that by the arrest the Ukrainian authorities violated several articles of the European Convention for the Protection of Human Rights, like Article 5 that guarantees liberty and personal security and Article 18 that sets the limit for the authorities on limitation of citizens’ rights. The ruling points out that Tymoshenko was deprived of the right to appeal her arrest and that she was put in custody for reasons other than the well-founded suspicion of violating the law. The court also rejected Tymoshenko’s claims that the authorities tortured her by depriving her of medical aid as she spent five months in pre-trial custody. Pro-Tymoshenko’s political party Batkivshchina (Fatherland) has already interpreted the ruling saying that the European Court of Human Rights recognized the arrest as politically-motivated. Tymoshenko’s attorney Sergey Vlasenko told the press that the ruling obliged the authorities to release Tymoshenko and restore her in her rights. Batkivshchina also said that they would demand international sanctions against Ukrainian prosecutors and judges who led Tymoshenko’s case. The Ukrainian plenipotentiary dealing with the European Court of Human Rights has said that the authorities needed to study the ruling and indicated that the government could possibly appeal the decision, Interfax reported. It should be noted that already after the sentence Tymoshenko complained to the HR Court that the authorities were violating her right for justice. The current ruling does not concern this appeal and it is expected that the court will look into it later. Tymoshenko is currently serving a seven-year sentence for abuse of power that took place when she was prime minister and allegedly signed a gas contract with Russia on unfavorable conditions, a move that supposedly cost the Ukrainian budget about US$190 million. The court also ordered that the former official compensated for the damages. In January 2013 prosecutors charged Tymoshenko with organizing the murder of a member of parliament. She dismissed the charges as lies.